WEST LAFAYETTE, Ind. 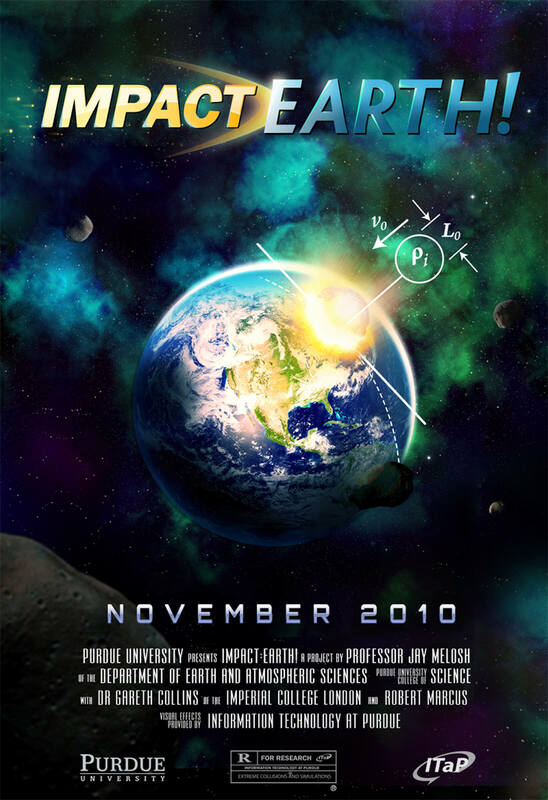 - Purdue University on Wednesday (Nov. 3) unveiled ''Impact: Earth!'' a new website that allows anyone to calculate the potential damage a comet or asteroid would cause if it hit the Earth. The interactive website is scientifically accurate enough to be used by homeland security and NASA, but user-friendly and visual enough for elementary school students, said Jay Melosh, the distinguished professor of earth and atmospheric sciences and physics at Purdue who led the creation of the impact effects calculator. More than 100 tons of material from asteroids and comets hits the Earth every day, he said. Even fragments as large as a sedan hurtle toward the planet a few times each year, but these burn up as they enter the atmosphere. Massive asteroids, like the 9-mile-wide Chicxulub that killed the dinosaurs 65 million years ago, are very rare, but smaller and more common asteroids have left craters that remain today. For instance, Arizona's famous Barringer Crater - nearly a mile wide - is evidence of an impact 50,000 years ago from an asteroid estimated to be 164 feet in diameter and composed of nickel and iron. According to the impact calculator, if an asteroid of similar composition but twice as large hit about 20 miles outside of Chicago, the impact energy would be equivalent to about 97 megatons of TNT. The resulting crater would be almost two miles wide and the impact would ignite a fireball with a one-mile radius. A magnitude 6 earthquake would shake the city approximately six seconds after impact, the air blast would shatter windows, and the Windy City would be coated in a fine dust of ejecta. The site states that impacts of this size occur roughly once every 15,000 years. 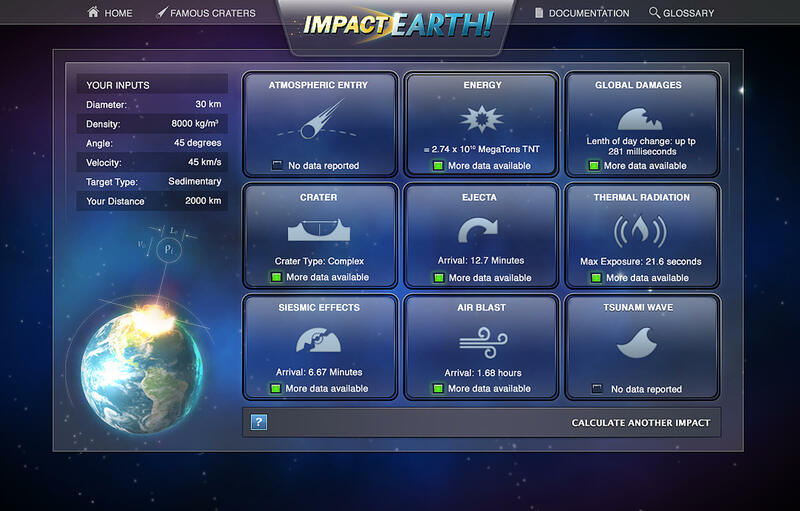 "Impact: Earth" is a more visual and user-friendly update to an impact calculator Melosh created with Robert Marcus and Gareth Collins about eight years ago while at the University of Arizona. Melosh and Collins collaborated with Information Technology at Purdue (ITaP) to update the program and create a graphic interface to make the site easier and more fun to use, he said. 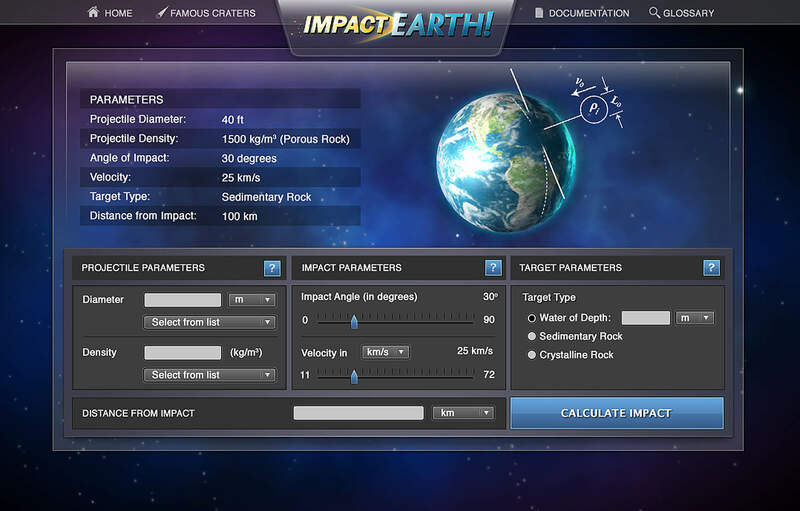 John Spray, director of the planetary and space science center at the University of New Brunswick in Canada, said the impact calculator is a valuable source for the scientifically accurate reconstruction of impact effects. "This calculator is a critical tool for determining the potential consequences of an impact," said Spray, who also runs the Earth Impacts Database of confirmed impact craters. "It is widely used by government and scientific agencies, as well as impact research groups and space enthusiasts throughout the world." In the week after the first impacts effects calculator launched there were 10 million hits from around the world. Today governmental agencies link to and use the site, including the Department of Homeland Security, NASA, the U.S. Geological Survey and the U.S. Air Force. The program is available in multiple languages and also is used by foreign governmental agencies, Melosh said. "It is a valuable tool to quantify the important impact processes that might affect the people, buildings and landscape in the vicinity of an impact event," he said. "With the program we include a scientific paper that describes the approximations and equations and discusses the uncertainty in our predictions. One can delve as much into the science as they would like." The calculator also has been a valuable tool in sparking young students' interest in science, Melosh said. "The calculator has been used by teachers and students from kindergarten through high school both for school projects and for fun," he said. "At one point we debated whether or not to use scientific notation in the results, but a teacher asked us to keep it. She told us that it inspired her class and the students worked hard to learn the method so they could fully understand the results." The ''Impact:Earth!'' calculator website was developed by Information Technology at Purdue (ITaP), which develops online tools to support learning and scientific discovery, including the nationally acclaimed classroom technologies HotSeat and Mixable. The site will be updated with additional features in coming months, according to the team. Melosh is part of the science team of NASA's EPOXI mission that will be evaluating the comet Hartley 2 on Thursday (Nov. 4). The mission uses the Deep Impact spacecraft that will fly to within 434 miles of the comet. This will be only the fifth time in history that a spacecraft has been close enough to take images of a comet's center. "Comets and asteroids have become a part of our popular culture, but we don't really know a lot about their composition and internal processes as they fly through space," Melosh said. "We have much more to learn about these objects that are often our closest neighbors in space. We do know that sometimes they enter into a collision course with the Earth, and this site offers an authoritative place to go to learn about the detailed effects of an impact."